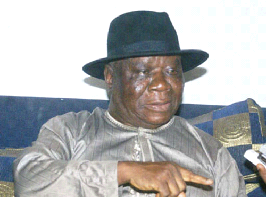 First Republic Information Minister and an elder of the Peoples Democratic Party, PDP, Chief Edwin Kiagbodo Clark, has been in a running battle against two-time governor of Delta State, Chief James Ibori and his successor whose election was recently annulled by the Court of Appeal, Dr. Emmanuel Uduaghan. In a no holds barred interview with Political Editor, Emmanuel Aziken and Deputy Political Editor Clifford Ndujihe, at his Apapa, Lagos residence, Clark, a lawyer, gave reasons he is against Uduaghan’s return to office, gives breath to what he claims as Uduaghan’s contrivance against President Goodluck Jonathan’s presidential aspiration and his stand on the crisis in the Delta State chapter of the PDP among other issues. Why is father figure like you fighting a young man like Dr Emmanuel Uduaghan? Do you have a problem with him or Chief James Ibori? I don’t have any problem with Uduaghan or even Ibori, let’s make it very clear. Starting with Ibori, I know I am an old man before I helped them. In 1998, I had never met Ibori before or even Uduaghan. The Delta traditional rulers and elders went to Abuja to pay solidarity visit to Late Gen. Sani Abacha after the phantom coup. While we were there, Abacha received us very well, then we left for our hotel. Then in the evening at about 7pm, two buses came to the hotel with the message that Major Al_Mustapha would like to see us at Aguda House. We went. We did not know what was going on. We had finished with Abacha and he (Mustapha) was there with Ibori. They entertained us. Then both of them read an address requesting that we should consider Ibori as a gubernatorial candidate. Then the Oredje of Okpe who is the leader of the traditional rulers replied what Mustapha had said and I also I replied. I said:“This is the gathering of traditional rulers and elders and you don’t ask traditional rulers to come and support one young man who wants to be governor. If Ibori wants to contest election, let him come home. That was how Ibori came to my village in Kiagbodo and was outside for about 40 minutes before I took notice of him and he said he wanted to contest election under the Grassroots Democratic Movement (GDM). Onerkhororaye at that time also wanted to contest election under the (United Nigeria Congress Party) UNCP. I supported Ibori and that was how I got to know him. I also asked my younger brother, Sokan Clark, who was later assassinated in Ughelli and one Ejiro Iremade to assist him. That was how I came to know Ibori. Abacha died and that time faded out. He wanted to contest election in 1999, I supported him. I made it possible for him to contest election in 1999, I supported him. Then, I was an old man, I had more resources than anyone of them. It was during that time that he told me he wanted to buy a house at Bendel Estate, Gborikoko. He bought the house and he was staying there. When Ibori was governor and later in 2002 or 2003, the case of ex_convict came, I decided to support him and defend it because Ibori told me that it was Chief Olusegun Obasanjo, who was doing it because he had supported Atiku Abubakar instead of Obasanjo continuing for another four years. I quickly remembered that Obasanjo’s late wife, Mrs Stella Obasanjo had phoned me during the convention to tell Ibori to leave the husband alone and to support the husband, which I did. So, I believed what Ibori told me and I took the trouble to support what Ibori told me with my money. I did all that. I fought even the Inspector General of Police, Mr Tafa Balogun at that time. So, as far as I am concerned, I have nothing against Ibori, but when Ibori decided to impose his cousin on us to cover his misdeeds and corruption, we said ‘no.’ Uduaghan had been disqualified in Port_Harcourt by the Hassan Adamu, Wakilu of Adamawa’s committee on verification. The same night, Uduaghan travelled throughout the night to Abuja where Ibori had prepared the grounds for him, and he was cleared. The congress was postponed and taken to Ogwashi_Uku. That same morning, Ibori invited some of the aspirants including Chief Omo Agege, Dr Ifeanyi Okowa, Pius Eweridho, Uduaghan and Amori. He said that Amori should be the witness, that God had told him in a dream that his cousin Uduaghan should succeed him. And whether people liked it or not, he would carry out the wish of God. Ask any of these people. Then, in the evening, they went to Ogwashi-Uku for the congress. Some people like Obielum and others ran away, they did not take part for fear of victimization, violence and so on. Even when Uduaghan was declared the winner, he did not obtain mandatory votes to make him candidate. They had to phone Okowa to withdraw, that was why he became Secretary to the State Government. These things are very annoying. I am a leader and how many people are senior to me in Delta State? Then my children will come under discredited people. That is what I am fighting for. In January 2007, we held a meeting in Abuja in a hotel owned by Cairo Ojougboh. I can give you the list of those who attended. We decided at that meeting to fight this issue. We must not allow Uduaghan to succeed Ibori. We went to Abuja between 5th and 11th of February, we were fighting. We saw Obasanjo twice. We saw Ribadu and we discovered that the forces against us were many. Ahmadu Ali, the National Chairman of the party had made arrangements with Ibori that his wife who did not attend congress for nomination as senatorial candidate should be nominated instead of either Ned Nwoko or Patrick Osakwe. You can see the wonders happening that Ibori could do anything. The corruption of Ibori also affected Uduaghan. We have now seen it in a London court where the sister of Ibori who is a cousin of Uduaghan and the trial of Udoamaka where they confessed that Uduaghan was involved in the money laundering. He was indicted that 59,000 Pounds and another 79,000 pounds were transferred to Christine Ibori by Uduaghan as Secretary to the State Government under Ibori. And a suitcase containing money was also transferred by Uduaghan to Christine. This was in the address of the QC who was prosecuting counsel and they are in the records of the trial there. How do you separate Ibori from Uduaghan? Now that you are asking why we are opposing Uduaghan, I will now give you an answer. I don’t hate Uduaghan as a person, he is a nice young man. Why we are against him is that when Ibori said that God had told him that his brother would succeed him and we said ‘no, you are putting him there to cover your misdeeds and corruption,’ evidence of what we said has come. Ribadu, the chairman of EFCC told us on the 9th of February 2007 in his office that Ibori was the most investigated and the most corrupt governor in Nigeria. That was how we knew that he could not visit England, that he was being wanted there. One evidence he told us was that Uduaghan was on the list of corrupt politicians that was submitted to the president but his name was removed when Obasanjo agreed that Uduaghan should become the governor. He said Ibori had used 12 companies to buy shares from Afribank worth N5billion and that the Federal Government caught him and asked him to return the money which he did. We asked Uduaghan when he came into office: ‘what of this N5billion that Ibori returned, we learnt you have returned this money to your brother?’ Is that not an evidence? Number two evidence of Uduaghan covering up the misdeeds of Ibori was when the London police, the Nigerian police and EFCC were moving towards Ibori, he ran to the Court in Benin seeking an injunction which he obtained that Ibori should not be arrested and prosecuted, that the EFCC should be prevented from getting government records from Asaba. If Uduaghan was a governor who is detached, will he take such an action to cover his brother? These are issues that are very clear; that this man cannot be our governor and can never be our governor again. When the Metropolitan Police were coming to visit Nigeria and when the scandal came out, the Federal Government directed the Federal Attorney General to go and vacate that injunction. Ibori was arrested from Kwara State Liaison office in Abuja and was taken to Kaduna to face trial. Ask Uduaghan, did Ibori pay for his defence? It was Delta State Government’s money that was used to pay for Ibori. Women were carried to Kaduna at government expense to demonstrate naked, they disrupted the court, one man died on the way, there was a special allowance for anyone that attended. Is that the man who should be ruling us whereas it has been proved in London, America, that Ibori is a criminal that everybody should be afraid of which nearly the whole clan has been convicted remaining Uduaghan? Ibori bought 800 million shares from Oceanic Bank. There was nothing wrong in buying shares but the moment they decided to mortgage those shares for a N44billion loan from Intercontinental bank, he was guilty of a criminal offence. He sold 500 million worth of shares to service the loan. When I asked Uduaghan, he said he was aware of it but there was nothing he could do. If a governor who had no relationship with Ibori was there, would he not follow it up? Will he not find out? V-mobile shares, Ibori assisted by his friend who was his front man, obtained a loan of N 2billion from New Nigerian Bank which was being controlled by Ibori and Igbinedion to buy Econet shares. It was these Econet shares that he bought for the Delta State Government that made him flamboyant. They sold part of the shares to Delta State Government for N2billion. Later, Ibori sold the shares for $38 million and stole the money. It was in the process of laundering this money in London that the three expatriates were arrested and they are today facing trial in London. And Ibori was indicted. Edevbie who was the Finance commissioner was indicted but because of Ibori’s influence at the villa at that time, David Edevbie was appointed principal secretary to Yar’Adua. We asked him again, are you aware of our $38million? Out of that amount, Ibori again borrowed $10 million for his company to pay some of his debts. Even if I am 83 years and I am still alive, will I not fight against this injustice? You want to belong to a state where one family sinks that state and nobody talks about it? They give you a little thing and you withdraw? These are some of the reasons why we did not want Uduaghan and never wanted Uduaghan to be our governor because he has done everything to cover the misdeeds and corruption of Ibori. Uduaghan and Ibori came to meet you in August/September 2007 in your home and during your birthday the following year, they came again. After he had pleaded with you, you told him that you were going to meet some elders to consider what he said. That is not true. Were you there? That is one of the propaganda. Ibori did not come with Uduaghan. Uduaghan came with Orubebe, the Minister of Special Duties. Ibori and Uduaghan had opposed his appointment, we went to the Chamber (Federal Executive Council Chamber) for Orubebe to be sworn in. We were shamed and humiliated and after some time the party leader came and said that the president said we should withdraw till further notice. I went out to the front of the villa and held a press conference condemning the attitude. Yar’Adua then said, two of them should settle. It was when that was said that both of them came to me at Kiagbodo. Ibori and Uduaghan never visited me together. He has been visiting me. And after some time, you mellowed down until the election was annulled? I have never mellowed down. Uduaghan came to me and I gave him two conditions. This issue of protecting Ibori, dissociate yourself from Ibori and let us settle. You are already governor. See that the party is one. Two, see that there is an integrated government where all people will be involved. He agreed. But Ibori told him not to. So you cannot have a government which is being manned by a faction of the community or party. Perhaps, that will strengthen his hand of dissociating himself from Ibori because our people will advise him. The deputy governor, Prof Atuama is there. Nothing came out of it. I mellowed down with reasons: one, dissociate yourself from your brother and two, let’s integrate and have a unity government. Today, the party is in pieces in Delta State. What has happened? INEC said it would not deal with any of these illegal executives were congresses were not properly held. On the 30th of September, the National Chairman of the PDP wrote a letter to INEC listing eight states where congresses should be conducted. What happened? Nwaoboshi ran to Abuja to obtain an injunction against INEC Chairman and the party’s National Chairman. The INEC said it would not deal with the executive in Delta unless you hold a legal congress. Which party is INEC going to deal with in Delta State? They are all joking. I thought Nwaoboshi was with you. When the new executive was formed, Uduaghan brought Solomon Ogba as secretary and the opposition brought Nwaoboshi. Did you investigate it? I was in my house one day in Warri when Nwaoboshi accompanied by one Doris Nwakobia, who is with us, came to me and said that he was interested in becoming the chairman of the party. I said, ‘I don’t know you.’ Even if Nwaoboshi comes here today, I cannot recognise him. I said, ‘I don’t know you.’ He said Obielum was behind him, Mrs Ali was behind him. I said, ‘everybody that comes to me receives my blessing. There are many candidates. If a proper congress is held, I won’t go against you.’ That was all. Then, there was no congress. The congress that was to be held was postponed. Emmanuel Ogidi, who was the chairman at that time said that Ali’s wife and her husband had kept the congress papers in their residence in Abuja and that if such things could not be sent to him as chairman, there would be no more election. So, the ward election that was to be held that day did not hold. I have a press release signed by Emmanuel Ogidi that the congresses were postponed. For them now to say that congresses were held is not true. So, Nwaoboshi was not my candidate. When they made him the chairman, we sat down and said we should also form our executive and Obiogu, Mrs.Ali and other members said we should include our people into the same people they had. We did not sit to pick Nwaoboshi as chairman. Have you counted the cost this your agitation may have on the higher agitation of your other “son”President Goodluck Jonathan? Will you sacrifice Jonathan for Uduaghan? President Jonathan can never be sacrificed for Uduaghan, who is unpopular in Delta State. Did you hear of the rally we held in Warri? It was the mother of all rallies. I attended rallies in Uyo and Port Harcourt thereafter, none of them could compare with the rally in Warri. We applied to the government to give us Warri Stadium, they refused. We invited Uduaghan, he did not come. Let us come to the details. Who is Uduaghan fooling? Who is fooling who? Uduaghan is not supporting Jonathan. When Yar’ Adua was ill in Saudi Arabia, Uduaghan was part of the cabal headed by Ibori. They drank champagne when Yar’ Adua arrived from Saudi Arabia thinking that the man was now coming to take over from Jonathan. Tell me any member of the House of Representatives from Delta State that actively supported Jonathan’s acting appointment in the House? The only senator that actively supported Smart Adeyemi and others was Prof. Adego Eferakeya. Today, they are victimising him for doing so. Amori now went to Dubai to be adopted by Ibori. Today, Amori is the government’s candidate for Delta Central Senatorial seat. Furthermore, Uduaghan is one of the few governors working with IBB and Saraki. In furtherance of our deliberation, sequel to our meeting at Nicon Noga on 17th October 2010 and dwelt as follows: At the meeting before all the caucuses present, total analysis of the electioneering success was made and financial responsibilities were happily undertaken to make our collectively dream a reality, particularly to have president of Northern extraction come 2011. Based on the above, you unflinchingly undertook to finance and sponsor a month salary of staff, a month media advertorial as a vehicle to mobilise core delegates of some states. Hence, it has become urgent to raise the funds and pledges to consolidate the success already achieved bearing in mind that the INEC is almost at the verge of issuing time frame for parties to conduct their primaries. Finally, thank you for the roles you have been playing in this project. Find the attached budget estimates for perusal. Thanks in appreciation of your immediate response. I can mention names. Uduaghan was one of those who believed that IBB should contest the presidency and in fact, he was going to be the running mate. So, what I am saying is that Uduaghan is not supporting President Jonathan. Without us, President Jonathan cannot win an election in Delta State. Without the support of Delta people, who believe in the Elders, Leaders and Stakeholders Forum, he cannot win. These were the people who organised a rally in Warri and Warri closed; markets closed that day. They have been trying to put a wedge between me and Jonathan. One day, they quoted Ango Abullahi and said that I hated Jonathan that I didn’t want him to be vice president to Yar’Adua. But they did not know how Jonathan became vice president. I am not here to disclose that. Most of them thought that they were going to use the executive; the delegates were going to be given to them. But that is gone with the INEC saying that anything submitted by Delta State executive of the PDP they would not honour it. Secondly, the removal of Uduaghan was God’s will. God has come to judgement. Goodluck Jonathan is really God-sent. With Uduaghan on the seat, Jonathan would have lost Delta delegates at the primaries. God has removed him. He is no longer in control of the delegates. Who told you that? Who did the President tell that he was going to lead the campaign to Delta State? Are you saying that the President will not campaign for Uduaghan? When the PDP fielded a candidate for the Anambra governorship election did the president go? Did Yar’Adua go to Ekiti for the re-run campaign? It was Jonathan who went. Even then, as far as we are concerned, the issue of whether Jonathan would lead the team or not has not been decided because there is no party executive in Delta State. The propaganda is that of Uduaghan. The National Headquarters of the PDP said Uduaghan is their candidate. If your party said somebody is their candidate and you are going against it is that not anti-party activity? That is very undemocratic. Who did they consult? Why will they remain in Abuja and say ‘Uduaghan is our candidate?’ Why didn’t they ask those of us who were against? I led the delegation to the National Secretariat on 21st July, we were received by the National Chairman. That delegation comprises two serving senators – Eferakeya and Osakwe, ministers, former ministers, etc and the National Chairman said that the PDP would not go into the election with a divided house. For him to make that statement was to gather some confidence. If your governor, who had been ruling for three and a half years was removed seven months to the thing, you would be shocked. So, any statement made by the National Chairman is not unusual but he cannot do it without consulting us. Is he coming to vote for Uduaghan? We are the ones who are going to vote, so he should consult us. Are you saying that Nwodo’s statement is not valid? The statement he made, if it is carried out, is undemocratic. They should consult the people who are the party members in Delta State. The way it is, who in your estimation should be the PDP candidate? We have gone to court, asking the court to interpret the judgment of the Court of Appeal, which said that Uduaghan had been occupying the Government House in Asaba illegally without the mandate and authority of the people; that there were no elections held in Delta State that they were ordering for fresh elections. We are learning everyday. I am a lawyer. They didn’t say there should be a ‘re-run,’ they said ‘fresh election’ because there were no elections conducted in Delta State. So, we are waiting. INEC cannot be the one to say because they don’t even know. We have asked INEC in a letter: ‘what is the difference between a re-run and fresh election?’ And that fresh election is based on the fact that there were no elections in Delta State. How do you react to comments that your statement of no election is contradictory as the House of Assembly election was held simultaneously with the governorship? How come there was House of Assembly election and no governorship election? The majority, if not all of them, were imposed on the people. There was no place where elections were held. The election in Burutu, my own Local Government, did not hold. The Divisional Police Officer, who was the senior police officer in Burutu, told me that no presiding officer had come to him, there were no election materials. The election in Burutu was held in Oleh and Uzere. Nobody voted. And because they are all members of Ibori and Uduaghan’s clan, nobody opposed them. And if somebody opposed them, how many cases went to the tribunal? Have you ever heard that the tribunal in Delta State decided cases in favour of people who are opposed to Uduaghan or Ibori? That was why the judgement of the Court of Appeal is ground shaking. In the case of Senator Osakwe, what was the position of his party, Accord Party? But he won. What happened? Ali, the chairman thought that by coming into an agreement with, Ibori would return his wife and the wife would become a senator. But the same Ibori asked Osakwe to go to Accord Party. And so, Ibori deceived Ali and Osakwe won. And Osakwe has moved to the PDP. If the PDP hierarchy insists on Uduaghan as its candidate, what would you do? Your own first cousin – Ibori’s sister has been jailed five years for money laundering and property seized. His mistress Udoamaka has been jailed for money laundering. Uduaghan is connected in all these. Thirdly, the innocent-looking wife of Ibori has been jailed and she too said Uduaghan was part of the problem. So, we too have our case to tell Mr. President. He is not a dictator. He would listen to us. If he convinces us, we have no choice. But if we convince him, must Uduaghan rule Delta State? What did he do for Delta people? Is there any project Uduaghan started and completed? There is none. The Airport in Asaba is scandalous.The Airport in Uyo cost less than N7 billion. Gombe cost less than that. The Delta one has cost N22 billion and they are talking about topography. What topography? Does Asaba have swampy land or hilly or what is it? Those people are corrupt. I am a senior citizen of Delta State, I will not close my eyes and allow my state to be raped by a clan. How would you react to the allegation that you are backing the opposition, Great Ogboru? I am not backing any opposition. We backed Great Ogboru in 2007. The meeting to back Ogboru was held at (Senator Fred) Brume’s house. And Brume wanted to contest a senatorial seat under DPP. He chickened out when they arrested him and sent him to Abuja where they put him in police custody. I went there to remove him from Police custody. They accused him that he was involved in kidnapping that he kidnaped two Indians. Are you going to endorse Ogboru again? No! We are going to dialogue both with Mr. President and the national chairman of the party. If we present our case and the President says let it be so, it is a different case. But if we also convince him that Uduaghan is not a fit and proper to rule Delta State, how do you say you are fighting corruption when Uduaghan is covering Ibori’s corruption and misdeeds in Delta? That is Uduaghan’s propaganda. The EFCC is probing IPP in Oghara. No due process was followed in awarding the Oghara IPP and N14 billion was paid. Where are the invoices, where are the documents? It is their document. Who are the other competitors? No due process was followed to award a N25 billion contract. Go to the site now, the place is bushy, the sign board is broken and fallen. Even if the machineries will take one year to arrive, what about the buildings where these things are going to be installed? Virtually all the road projects are abandoned. Things are very bad. As a PDP elder, would you be happy if Delta State falls to the opposition? That is not the question. I am a PDP man. In 2007, there was no election. Three and half years after, the court said this injustice must be cured. They said this kind of thing could not happen in civilised countries. Is that not an indictment on Ibori and Uduaghan? Uduaghan’s supporters said he regards you as a father. If he comes to you for settlement, what will be your response? We have no personal issues. All I am saying is that I cannot settle with Uduaghan at the expense of the generality of the people in Delta State. The welfare of the people of Delta is of paramount interest to me. So, settling with Uduaghan will not solve the problem. It is not by saying, ‘I am sorry, I will not do it again.’ He has harmed people. We have the most impoverished people in this country. Our state is going down. Teachers were employed, for a whole year, none of them got paid. He has done much damage. The street light in Asaba is being powered by generator. They said they spent N250 million on Efurun Roundabout, what is there at Efurun Roundabout? Building cinema everywhere? We are tired, enough is enough. I WANT TO HEAR FROM .